The very best cheese « affineurs » work but a short distance from the Alps, on either side of the Beaujolais foothills. On the western side, in Roanne, Hervé Mons keeps on eye on his cellars and supplies the famous Troisgros restaurant. On the eastern side, in Lyons, Christian Janier upholds a family tradition spanning almost a century. Both were recently awarded the prestigious title of « Best tradesman in France » that was attributed for the first time last year to professionals in the cheese sector. Succulent portraits. There are dozens and dozens of cheeses throughout the Alps, from the tiny goat cheeses in southern climes to the « big wheels » in Austria. They may be divided into a number of large families, but with an infinite number of local variations. This vast and tasty assortment combines an array of savours and aromas with a multitude of shapes and colours in a marvellous medley. A map and tables listing the characteristics of all the cheeses in the Alps. An impressive document, never before published. Milk fermented then dried versus milk curdled using rennet. Two techniques and above all two different worlds in opposition since antiquity. On the one hand, the uncouth cheese of the nomads on the Asian steppes, koumys or qurut, and on the other the civilised cheese of the sedentary farmers in the West. A dual character that reflects the ambivalent nature of this mythical fare. Treatises on nutrition, medicine and hygiene abounded in the Middle Ages. Certain works were copiously illustrated, for example, the Tacuinum sanitatis, which contains a few images of cheese, a foodstuff not highly thought of at the time. But a Piedmontese doctor decided to innovate with a great work on dairy products and the result is a very interesting cheese atlas. Swiss cheese to save the forest ? The central government in France has always been wary of farmers and even more so of mountain farmers. Proof of that is the reform imposed by the National Forestry Commission in the 1800’s to encourage the production of Gruyère cheese in the southern Alps ! The goal was to clear out the goats and sheep who were thought to be destroying the forest and to replace them with cows. The reform produced cheese dairies and raised great hopes, but finally resulted in an acceleration of rural depopulation. Austria is hardly the most distinguished contributor to the Alpine cheese assortment. That is a paradoxical situation for a country consisting largely of mountains and high pastures. Unfortunately, strict regulations and the overbearing presence of the typical cheese wheels have impeded the development of local and original products. A situation that might well change in the near future. The Milky Way, galaxies, seracs and glacier milk, all derive from milk and cheese which are just as useful in naming our universe as they are good to eat and drink. Stretching back in time, far beyond the now general dominion of reason, these fostering metaphors place human life in an all encompassing perception of the continuity of vital processes and the nature of living beings in the universe. The beggar among cheeses, the sérac would appear to be on the path to oblivion. A pure product of the Alps, this outcast of dairy production is not without its strong points nor its fanciers. But for many, this cheese made of whey evokes the meagre foodstuffs on which Alpine dwellers of old subsisted. A false image of a product that merits a second try. ‘Tis a surprising alliance, that between aesthetics, phytotherapy and gastronomy. 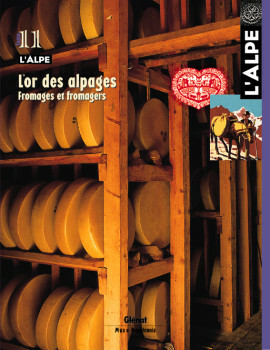 Since time immemorial, Alpine plants have contributed to cheese production. Not only as substitutes for rennet, but also as sources of aromas, colours and savours for cheeses. A trip to the land of trigonellas, achilleas, asperulas and the blue melilotus. An entire culture may be discovered under its crust, as uneven as an old granite block covered with lichen. The tomme is not simply a cheese. For generations of Savoyards, it represents, with a chunk of bread, the essence of nourishment, the basic meal while keeping an eye on the herd or during a pause while mowing the hay. The purpose of the protected designation of origin (PDO) and the protected geographical indication (PGI) is to ensure that the selected major Alpine cheeses maintain their full flavour and character. However, the regulations can lead to decidedly perverse results, notably concerning the diversity of our culinary heritage and the continued existence of « farm » products. Swiss photographer Nicolas Repond captures the essence of the Alps like no one else. A worthy member in the long line of humanist photographers, he casts the perceptive eye of a creative spirit, tender yet demanding, inquisitive yet funny, on a subject that is hardly new, cheese production in the Gruyère region. A naïve history of a community in the southern Alps, the commemorative plaques placed in a small chapel in Pigna recount the dramatic events punctuating the daily life of the mountain dwellers. The colourful snapshots represent an early form of local gazette and touchingly testify to the trials and tribulations of a handful of Alpine peasants. Marvellous, the Alps ? Necessarily marvellous ? That was not the reaction of François-René de Chateaubriand when he visited the valley of Chamonix in August 1805, following trips to Italy and the Americas. His Voyage au Mont-Blanc is one of his lesser-known texts and a surprising essay in which he counters the romantic view of mountain landscapes. But just what do those people in the Savoy want ? Obscure efforts in the Savoy to achieve independence have resulted in a rare degree of media confusion. Accused of being anti-central government, extremist, dogmatic and a local-identity fad, the movement was definitively condemned and anyone tempted to think otherwise is immediately suspected of harbouring dubious inclinations. But, all the confusion notwithstanding, what if the phenomenon is in fact a foil calling into question the basic operation of our democracies ? An inquiry.